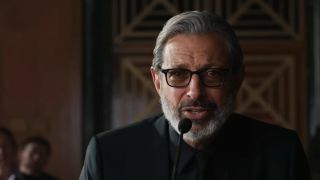 "I think when I finished my stint on the two, I didn’t know that they’d make more"
In a new interview with SFX magazine, international treasure and Jurassic World: Fallen Kingdom star Jeff Goldblum talks about returning as Dr. Ian Malcolm, and why he seems to always get cast in the role of the scientist. "I haven’t sought them out - especially now, as ever, I’m trying to get better as I go along, seeking a variety of things," he tells SFX. Subscribe: You can sign up for future issues of SFX magazine for more exclusive news and features on Jurassic World: Fallen Kingdom, Ant-Man and the Wasp, and more. Subscribe now! "Those scientists are different from one another and they’re all enjoyable roles, and now I’ve come to research a little bit through the demands of these parts, I’ve come to highly esteem science and scientists. Now if I passed on any wisdom or worldview to my kids, I think it would be to expose them to Neil DeGrasse Tyson and to the facts of the universe as we know them." Goldblum also talked about being asked to come back to the franchise as Malcolm, a role he last played way back in 1997 in The Lost World: Jurassic Park. "I think when I finished my stint on the two, I didn’t know that they’d make more," he says. "But I was thrilled to be asked to return to this beautiful production empire because they’ve always been so sweet to me, and I had such a good time on the first couple - Mr Spielberg was delightful to work with, very creative - it was an educational, creative and playful time." For more on Jurassic World: Fallen Kingdom, be sure to pick up the latest issue of SFX magazine, out now.